I have always wanted to be a priest from the time I was a little kid. It’s the only thing that I have ever really wanted to do. So as I got older I felt that this desire to be a priest was God calling me. The desire and the call stuck with me all the way through high school, so in my senior year the seminary was the only school I applied for. So I am the fifth of 14 children. I was homeschooled my whole life. This allowed my family to greatly affect my discernment and my ability to hear God’s call. My mom took my siblings and me to 8 a.m. Mass every day at my home parish, St. Ignatius Loyola in Sinking Spring. This is one of the most important things for my discernment. From a very early age attending Mass allowed me to interact with my parish priests, especially my former pastor Msgr. James Treston. It also was very helpful to my discernment that we prayed the rosary every night as a family. My parents also encouraged my siblings and me to read the lives of the saints, as well as books about our Catholic faith. When it comes to reading, I love to study history as well as J.R.R. Tolkien and the writings of St. Alphonsus Liguori. I also enjoy weight lifting – we have a weight room at the seminary – and board games. It’s pretty great. The school itself is a lot of work, but very interesting. I have also had the chance to meet a lot of great people due to some of the events I’ve attended as a seminarian. Being at the seminary has given me plenty of opportunities to grow spiritually, which has been a real blessing. 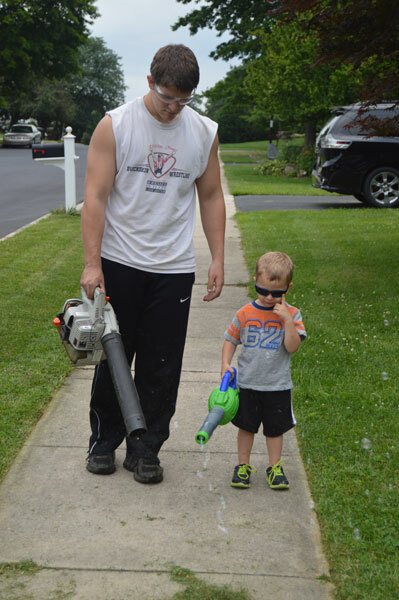 Keaton Eidle, Diocesan seminarian, clears lawn clippings at his home while his little brother, Wilson Eidle, creates bubbles with his blower.